Tianjin Armorus Textiles Co., LTD supplies body armors mostly made of two types of industrial fiber: Aramid fiber and Polyethylene fiber. Since the imported Aramid fiber is not sufficiently competitively availed of now from oversea manufacturers, we are mainly adopting the domestic fiber - High Tenacity High Modulus Polyethylene fiber at present for our body armor products. High Tenacity High Modulus Polyethylene fiber, also called the Ultra High Molecular Weight Polyethylene (UHMWPE) fiber, is a kind of high technology high performance fiber developed in last decades. Compared with the other two high technology fibers in current world (carbon fiber and Armaid fiber), Polyethylene fiber has the highest tenacity because of its high molecular weight, high interlinking, high degree of orientation and high Crystallionity. Its tenacity is 14 times higher than good quality steel, and 10 times higher than normal chemical fiber; this fiber also characterizes as low density, high modulus, UV resistance, corrosion resistance, outstanding anti-impact and anti-incision, etc. It is now widely used in national defense weaponry, such as soft bulletproof vest, light weight bulletproof helmet, armor plate, stab-proof vest, etc. Other applications are composite material for aviation and ocean shipping, rope for navy vessel, tow net for ocean halieutics, sports equipment and construction reinforcement composite material, etc. 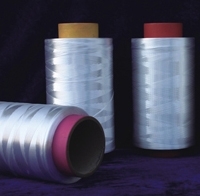 Below are the properties contrasts of the polyethylene fiber with other industrial fibers.